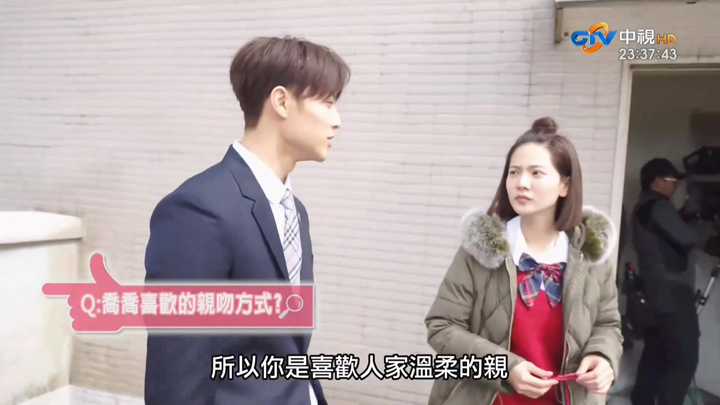 We came across the behind the scenes for Attention Love Episode 2 (稍息立正我愛你 Episode 2 BTS) and thought to recap and translate it for the interesting interactions between Joanne Tseng and Wang Zi. Wang Zi’s pretty playful on set. It was also interesting to see the small struggle each of them had whilst filming a scene or learning a line. We’d liked to give a heads up and say that there are some parts of the BTS (behind the scenes) that we did struggle to hear and translate. We’ve made notes stating our inability to translate the part. 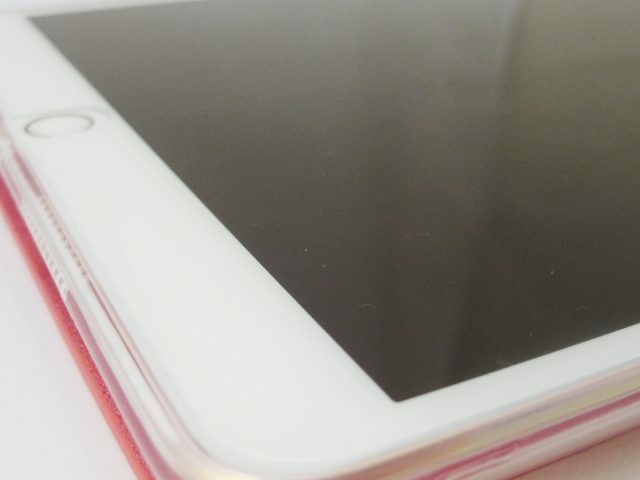 Our primary language is not Mandarin-Chinese and we translate by the Chinese subtitles that are supplied in the videos. 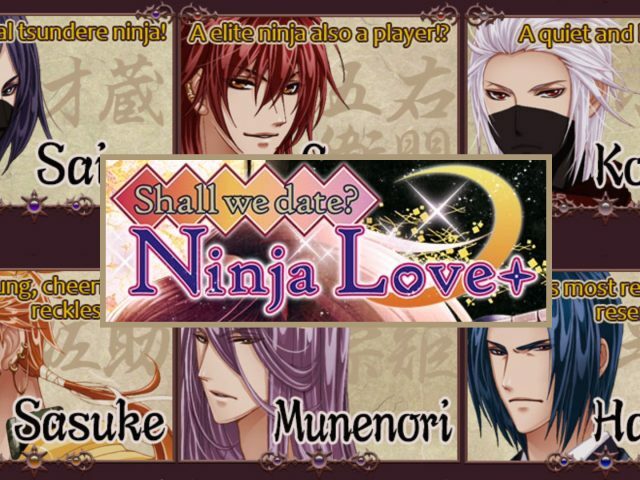 Please do enjoy our Attention Love Episode 2: Behind the Scenes translations accompanied by images! 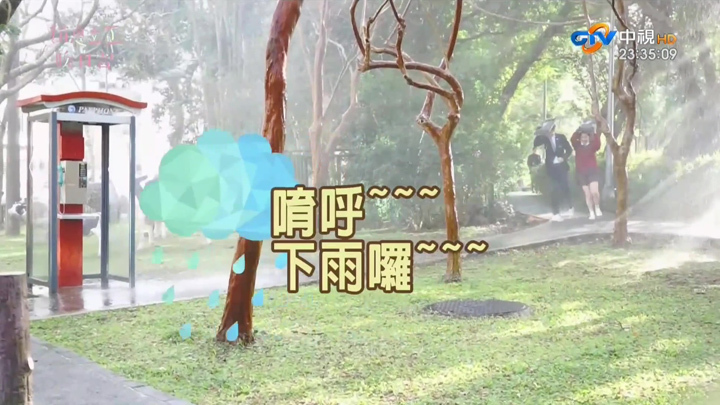 Joanne Tseng and Wang Zi rehearse the scene where Zhong Shao Xi run into some poo after being chased. Don’t worry. They left already. I discovered nothing good has happened since meeting you. You’re the one who “dai shuai”. 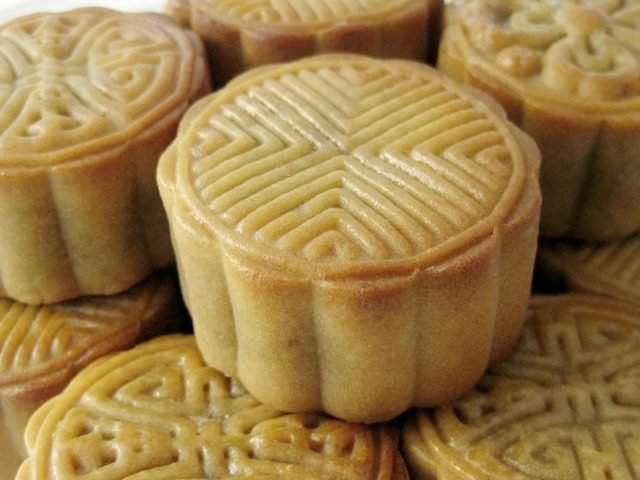 What’s the meaning of “dai shuai”? It means when a person’s luck isn’t great it’s like running into poo. (Looks down at the spot where poo should be.) I really ran into poo. (Lifts foot.) I really stood on poo. (Starts trying to wipe it off on the concrete.) Such bad luck! Yan Li Zheng watches on and starts laughing. Zhong Shao Xi tries wiping it off on a plant pot. Back to trying to get it off on the concrete. Meanwhile Yan Li Zheng is still laughing hard. Joanne Tseng reveals that she’d find stepping on poo so embarrassing if she was with a guy she liked. 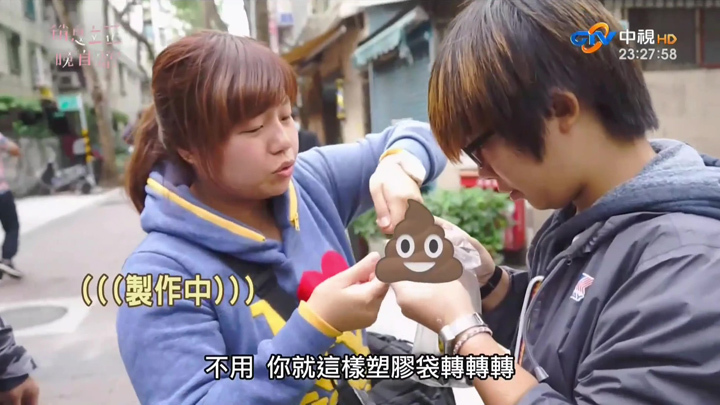 Wondering which Wang Zi thought was more embarrassing—stepping on poo or farting—she asks him. Because, you know, if Wang Zi says stepping on poo is fine then there’s nothing to worry about for her character Zhong Shao Xi. Funny stuff watching both Joanne Tseng and Wang Zi being so responsive to each other and laughing at each others’ response. QUESTION: Is stepping on poo embarrassing? I’d want to die so bad. I really will… I really will go crazy. I would disappear from his life from that point on. The answer has Joanne Tseng doubled over laughing. Wang Zi’s laughing, too. Is this more embarrassing or farting more embarrassing? Farting is more embarrassing. Okay. Then that’s okay. The team try to make fake poo and have it stick to the bottom of the shoe, but they seem to have problems with it staying on. Did they use real poo in the end as Wang Zi devilishly suggests? No need to do that. You just need to twist the plastic bag. Then just dip it. That’ll do. Cut to Joanne Tseng sitting on the side talking about the fake poo. Don’t worry, everyone. It’s just chocolate. It’s 80% chocolate and 20% poo. There’s 20% poo. It’s still scary. Cut to stepping on the fake poo. Joanne Tseng mentions how painful it is to step on it. She’s also laughing a little at the same time as she tries to step on the fake poo so they can prepare for rehearsal/filming. 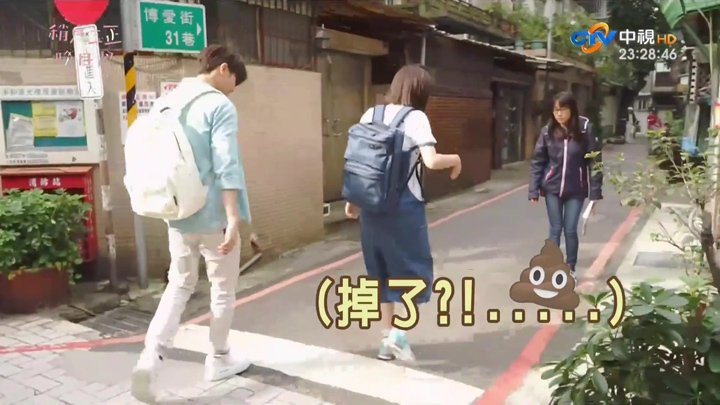 For a bit there, we thought maybe the fake poo is quite solid making it hard to step on, but Joanne Tseng said it’s soft (we think it was her who shouted it) so it looks like the pain is in terms of how much she’s suffereing rather than actually being physically painful. If it’s really 80% chocolate and 20%, we’d find it a bit ‘painful’ to deliberately step on poo. Such nice runners and she has to stand on 20% poo. : oO : oO. It feels like you haven’t stood on it. Wear it down a bit. Wear it down a bit. Wear it down a bit. Wear it down a bit then it will stick on. Joanne Tseng grinds her foot as instructed by the crew. How about I help you press it in? Okay, let me see if it’s on your foot. It’s on. It’s on. It’s on. It has to be on. Is it sticking more and more? Wang Zi, appearing from behind the camera, supports Joanne Tseng by the arm and helps her to the location for the shoot. A few steps towards the filming location, the fake poo’s come off. Be careful it doesn’t come off. The crew moves to try get the fake poo to stick. By our count, there are two or three crouched down trying to get the poo to stick, with a few more watching on. With the trouble they’re having just to get a bit of poo onto the bottom of Joanne Tseng’s shoe, it’s here Wang Zi jokes about using real poo . I’ve finished smearing it for you. How about stepping on a real one then? Yan Li Zheng suggested it. Step on one for real. The leads are off to film (rehearse?). 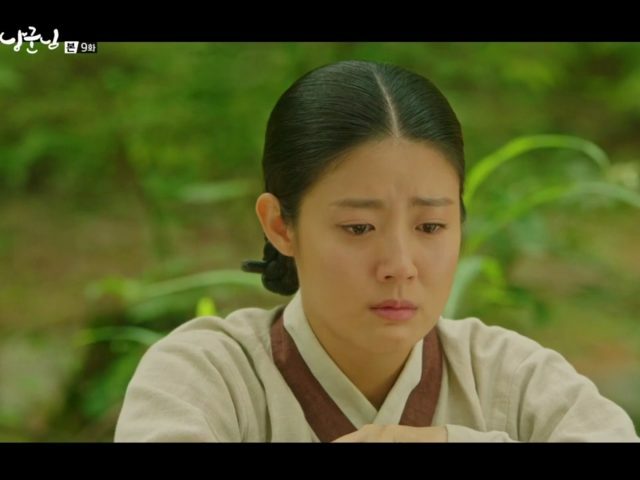 Zhong Shao Xi tries to wipe off the poo she stood and asks for Yan Li Zheng’s help. He doesn’t and just stands there laughing at her. Hurry… lend me a hand. Yan Li Zheng backs away from her, laughing. Jump cut. Cut to next shot where Zhong Shao Xi asks for Yan Li Zheng’s help in ridding the poo. Help me find something to get rid of it. Yan Li Zheng’s not going touch that shoe. Still laughing away, he refuses with folded arms, backing away from the shoe she holds up to him. It feels like I’m over it now. I’m not that scared now. QUESTION: Tips on stepping on poo? It was very scary stepping on poo the first time. Extremely. Did you see my expression? I think it probably shouldn’t have shown through that I wanted to scream ‘ahhhh’. I really wanted to. If it weren’t for the fact a relatively quiet alley was nearby, I think I really would have wanted to scream out loud. Where did you wipe it? 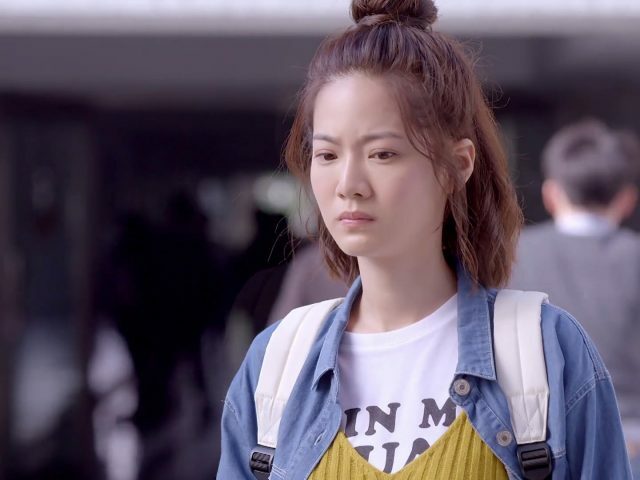 Joanne Tseng misses the questions and continues the rest of her thoughts. The memory of having stood on poo all came rushing back. Zhong Shao Xi, did you forget our agreement? Where is your homework? Cut to Zhong Shao Xi, who’s not paying attention as she’s reading a note. 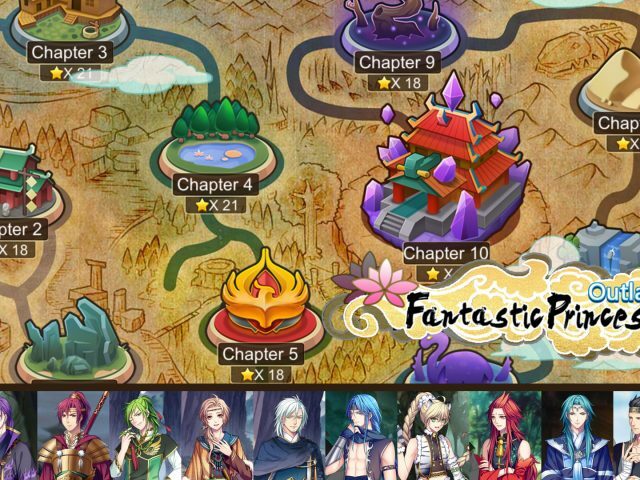 Shao Xi, look at your teacher. 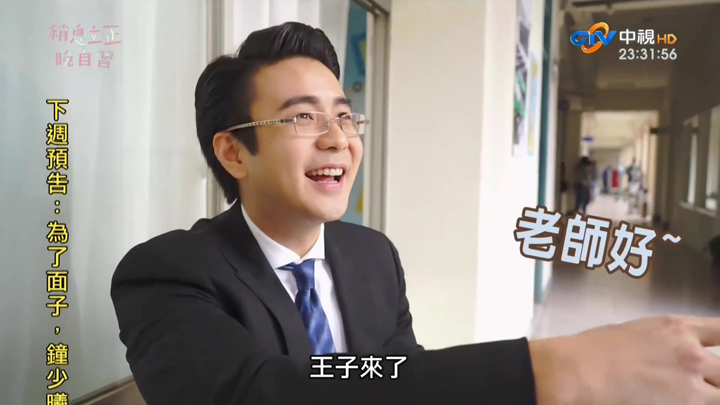 Interviewer interviews Huang Xin Di (who plays Li Ru Ping in the drama) about the upcoming scene of passing notes and this popular pose where the class frames their chins with a hand. QUESTION: Is there anything fun? 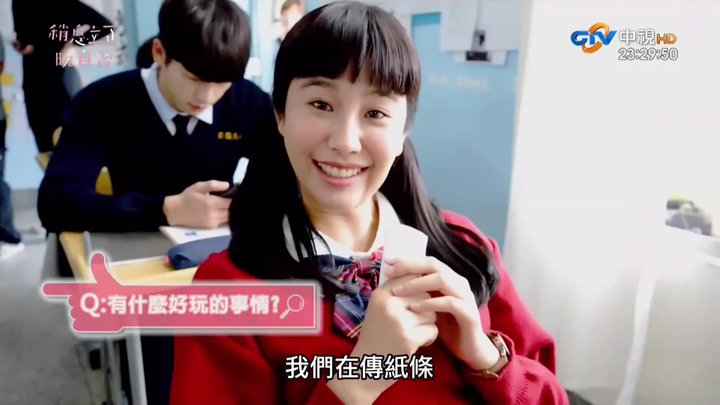 Huang Xin Di’s gaze moves to her actor-classmates. Most favourite thing in class is passing notes, isn’t that right? You all love passing notes. They’re all not listening in class and passing notes. We go to class and pass notes at the same time. I want to ask Xi Xi if she’s seriously finishing her homework. This? 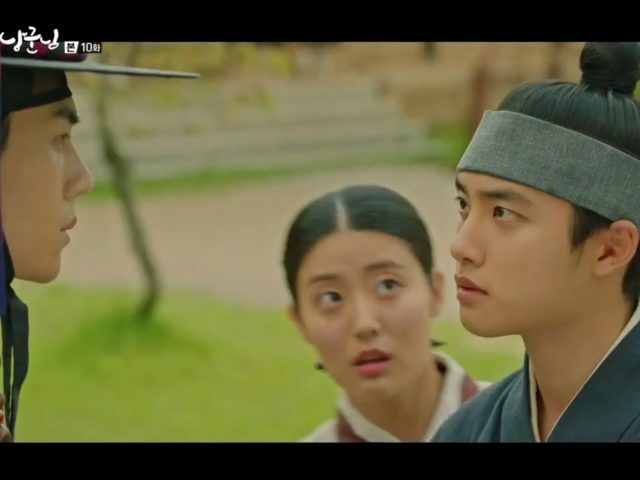 (To her actor-classmates) Come. Let’s do this together. Camera zooms out to show her actor-classmates also doing the hand poses. This is our hip pose. Isn’t that right? Because… why is it (our pose)? Because it makes our face look small. Cut to Zhong Shao Xi trying to pay attention to class before receiving a note, after which is seen to give the hand pose. Let us open to Page 62. It looks like the hand pose is one which was very popular back when Joanne Tseng was 12 years old. 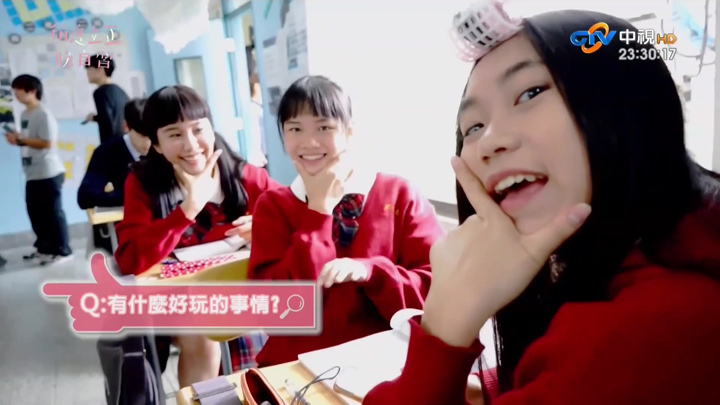 It makes her laugh thinking that she (as Zhong Xiao Xi) will be using this popular fifth/sixth grade pose in the drama. Sixteen years since the pose became popular, could it make a come back? QUESTION: What’s a hip pose at the moment? Do you want to know what we’re talking about? A few days ago we were joking about how this pose very popular. Do you know what happened? Fifth and sixth graders were spreading it. Then they talked to the high schoolers and unexpectedly discovered they were throwing around this pose. I couldn’t believe it. They said it made the face look small. The time this pose came in, I think I was 12. 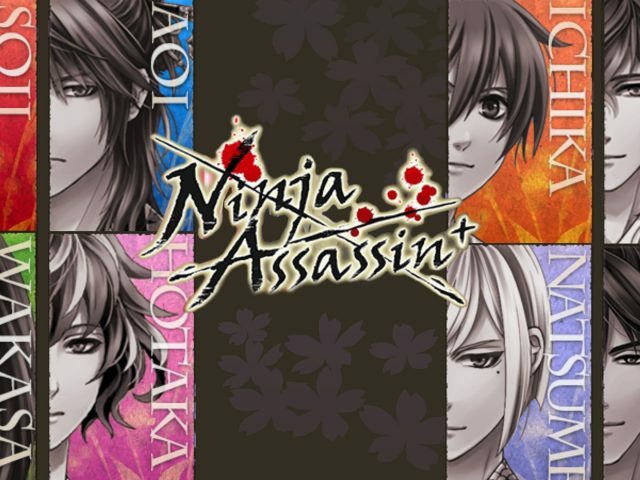 After 16 years, is this making a come back?! (Laughs again.) I’m about to faint. So, in a moment I’ll be using this pose in the drama. I’m not trying to be funny. It really spread. Zhong Shao Xi is outside Yan Li Zheng’s classroom, entranced by the sight before her. Who’s she looking at so captivatingly? We’re made to think it must be Yan Li Zheng (as it was in the drama), but no. It’s Teacher Xiao Mu Zhi. He’s writing a quote on the blackboard, which serves as a backdrop to the scene. Liu Zhi Qian as Teacher Xiao Mu Zhi. I’m Liu Zhi Qian. Today, I’m playing Teacher Xiao Mu Zhi. Liu Zhi Qian waves his pinky finger, showing that his character’s name, Xiao Mu Zhi, means pinky finger. He’s the kind of teacher who students hates the most. This is your level. You want to go to a public university. Who do you want to laugh at? Not quite sure if the above is correct. The interviewer speaks of Liu Zhi Qian in a generalised way, using words like “ni men” (you all) throughout. Not super well-versed in Mandarin, the sentence construction is strange for us. Correct. I feel a bit embarrassed to even say it with my own mouth. I myself wouldn’t say such things. Wang Zi makes an appearance, which as Liu Zhi Qian greet him quite happily. The interview has Liu Zhi Qian give his thoughts on Yan Li Zheng. QUESTION: Impression of Yan Li Zheng? 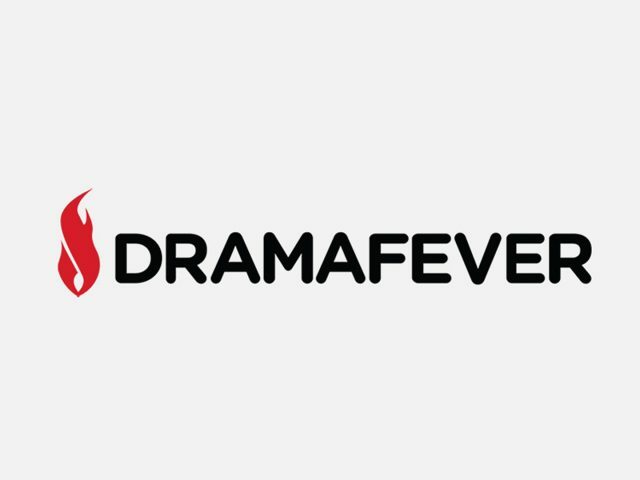 My impression of this student in the drama is I feel he performs pretty true to life. He’s very, very amazing. Later, he turns out to be quite an adorable person as well. 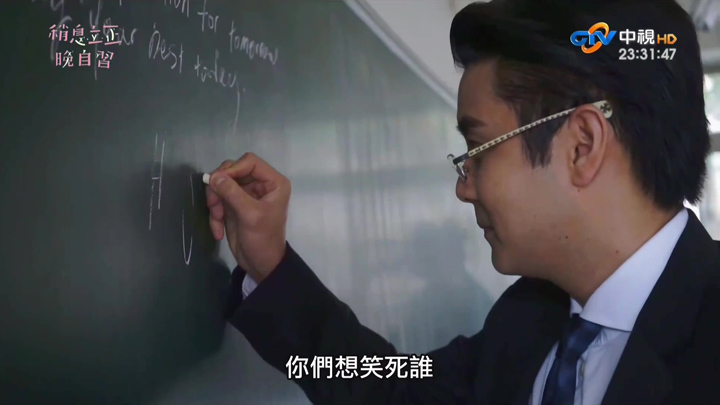 Wang Zi must remember the calculus question he, as Yan Li Zheng, must write on the blackboard. He struggles a couple times and needs to look it up on his phone. We’re not sure if we’ve translated what Wang Zi says correctly as we’re not familiar with the mathematic terms when spoken in Chinese. 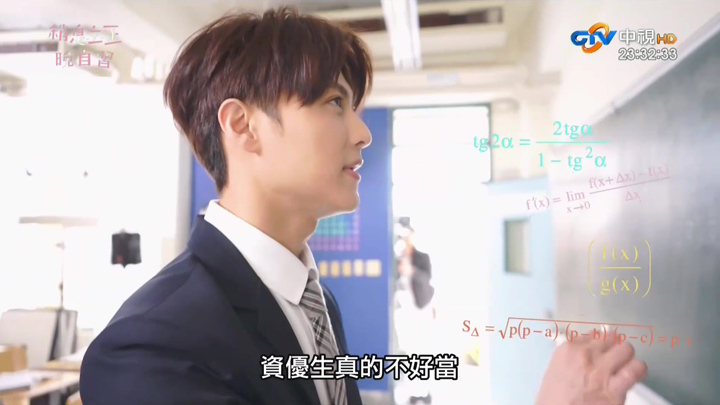 According to the what’s written on the blackboard, the section of equation he might be trying to memorise is absolute value of x+2y-2z-1 over √1+4+4. It sounds a bit different to what he reads out on his cellphone, though. A couple of the numbers are different. Maybe he has a slightly different equation on his phone. I have to write this on the blackboard. I have to memorise it. X+2Y… something minus 1 over 2 minus absolute value 1. 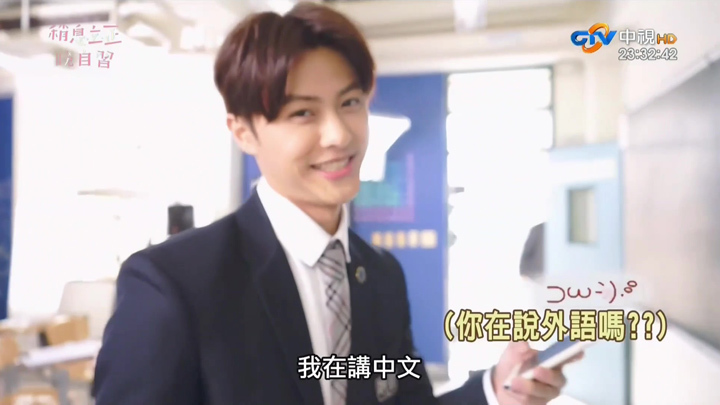 Not remembering what comes next, Wang Zi refers to his cell phone, reciting half the equation off the cellphone before trying to memorise it without looking, all the while talking to the camera. Then what was it…? D2=2X+Y+2Z-2 absolute value root 4 + 1 + 4. Wang Zi shakes his head. He’s not managed to get it all memorised. It’s playing with me… I’m really not doing a good job of being an outstanding student. 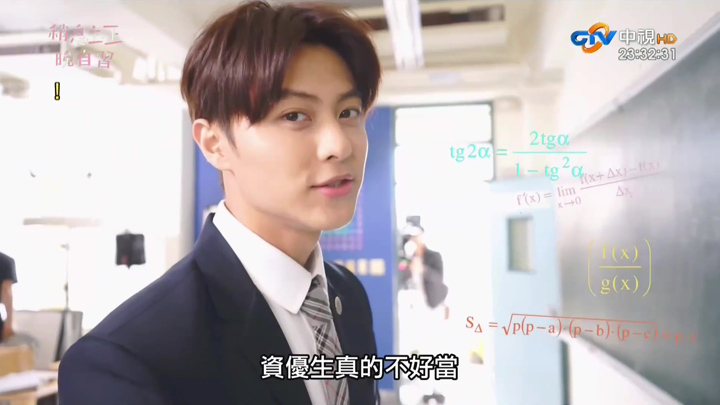 Wang Zi goes back to trying to memorise the equation again, doing well up to the same point he had trouble memorising just before. Wang Zi stops and looks at his cellphone again for the rest of the equation. Are you speaking a foreign language? Jump shot to Wang Zi still trying to learn the equation. When memorising, it’s like how can it be so hard to learn. It’s harder to memorise than lines. Cut to filming the scene. We don’t see Wang Zi deliver the lines though. Joanne Tseng and Wang Zi film the scene where Yan Li Zheng ends up picking a petal from Zhong Shao Xi’s hair. The director had two versions of the shot taken as it seems they were undecided on which was more like something Yan Li Zheng would do at the time of filming. Joanne Tseng and Wang Zi imagine staring at something in the air. An animated mosquito is used to stand in for the thing they’re meant to track. Track it. Look up above a little slower… A little slower. It’s actually not a mosquito. It’s a petal. 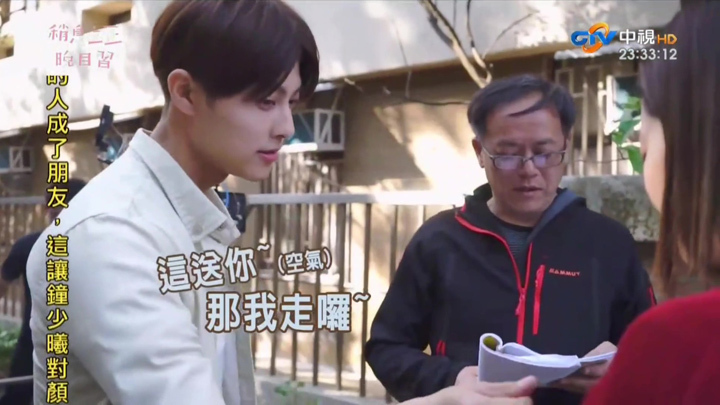 Director is beside Wang Zi and Joanne Tseng, appearing to be running through the scene of where the petal will land on Joanne Tseng’s hair. After which, Wang Zi is to pick it from her hair. He slowly stretches out a hand and gives me air (i.e. nothing). 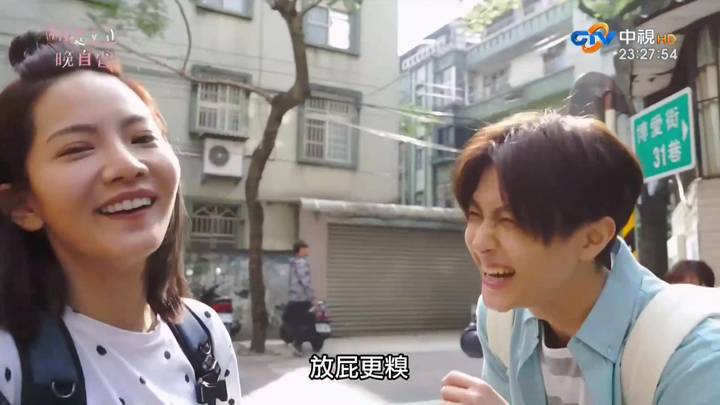 The crew is heard laughing in the background, so maybe Joanne Tseng was joking around? Actual scene in the filming. Yan Li Zheng notices the petal on Zhong Xiao Xi’s hair. A petal is on your hair. Yan Li Zheng picks the petal from top of Zhong Shao Xi’s ear and holds on to it. Second version, the version that made it to broadcast, has Yan Li Zheng blow the petal away instead of what we saw in rehearsals where he gave it to her. :oO :oO. QUESTION: [Why the] two methods to the petal flying away? 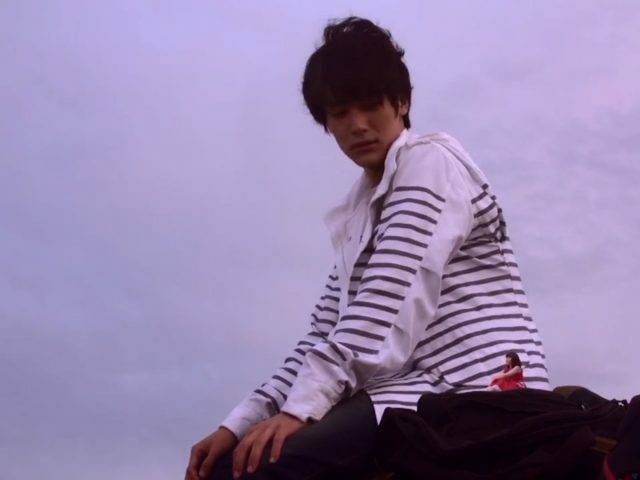 Among the shots is one the director thought was okay, but the producer felt that blowing the petal didn’t feel like it was in Yan Li Zheng’s character. It came off as trying a bit too hard to look cool. That’s why it was quite normal to throw it away. 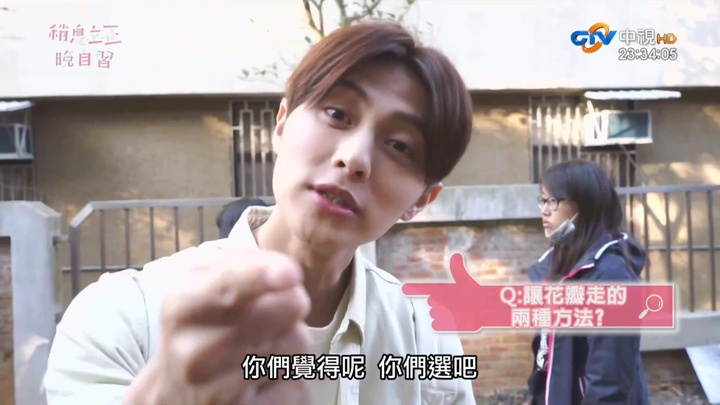 Wang Zi then stares directly at the camera to talk to us viewers. What do you all think? You choose. I’ll read your messages. Should the petal be blown away or should the petal not be blown? I’ll have a bit of a look myself. Hmm… we choose Yan Li Zheng blowing it away. 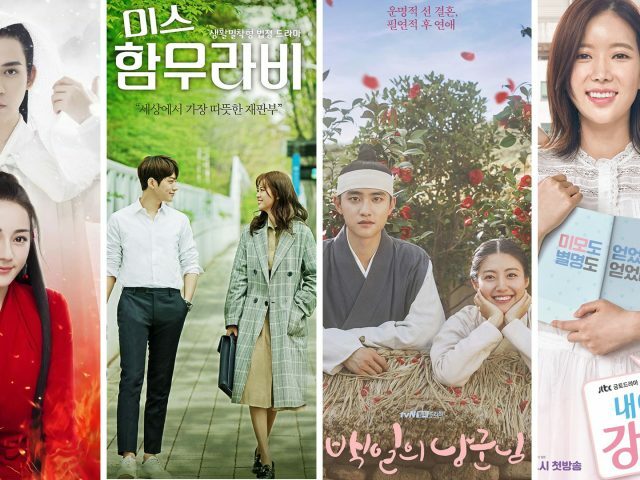 Slow burn romances, denial of hidden feelings are always more fun to watch. As for whether it’s within Yan Li Zheng’s character, probably it would have worked the other way. With Zhong Shao Xi being his first true friend, he could probably feel enough appreciation for her friendship to give her the petal. So gifting it would have still worked. A later scene could then try and have him clueless about the meaning or deny the meaning behind his actions. Maybe? 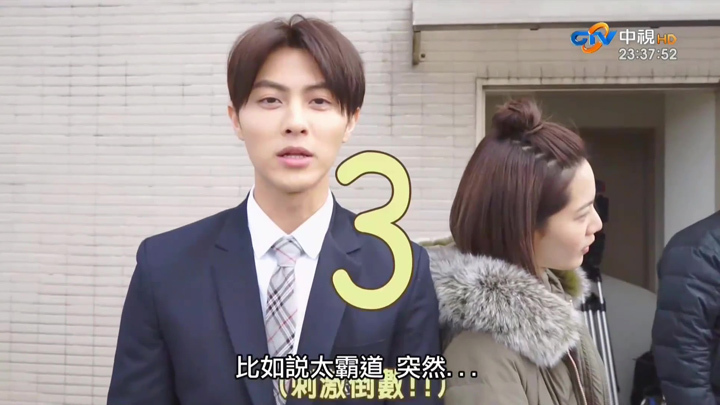 Wang Zi and Joanne Tseng practices the lines in the scene where Yan Li Zheng mispronounces the ‘le’ and ‘re’ as used to say words such as ‘happy’ and ‘hot’. The rain is so heavy. But why does it feel so hot? Hao le! Kuai le! Hao le. Hao le kuai le. 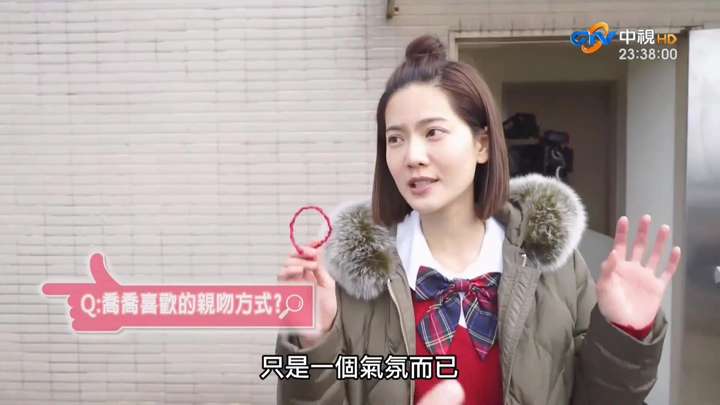 Pausing rehearsals, Joanne Tseng explains what happens after in the scene. 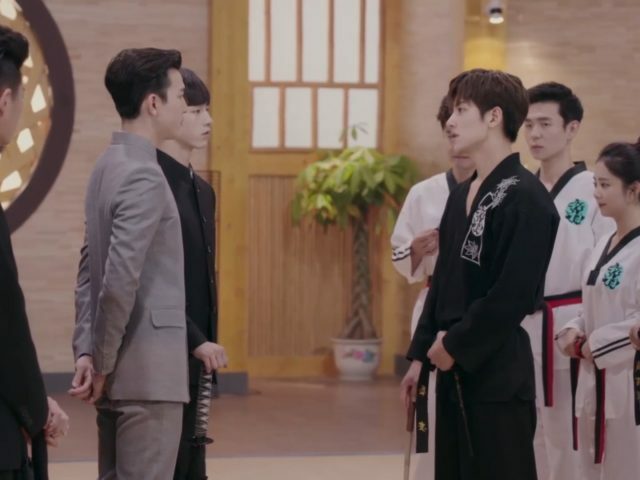 Wang Zi decides to joke around and add his version of what happens between Zhong Shao Xi and Yan Li Zheng, which catches Joanne Tseng unaware. After that there’s no speaking between the two. We’ll be laughing on the side. It’s “yes”, “yes”, “haha” and straight lips, etc, etc, etc. Playing around, Wang Zi surprisingly closes the gap between him and Joanne Tseng and pretends to go in for a kiss! :oO :oO. 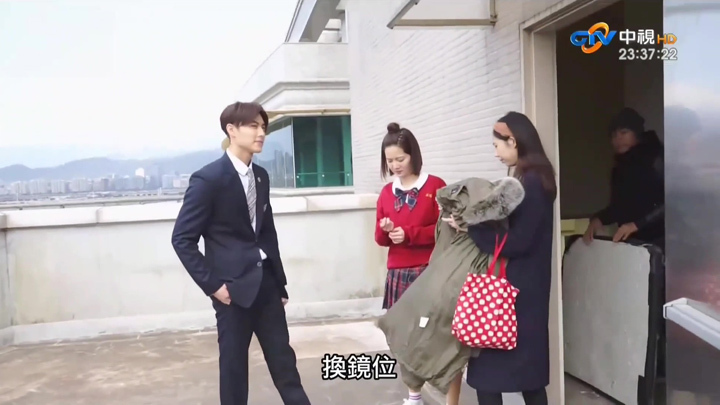 It earns Wang Zi a light slap across his shoulder as it catches Joanne Tseng off guard. Every time, it always plays out this way. It never gets old. Cut shot. 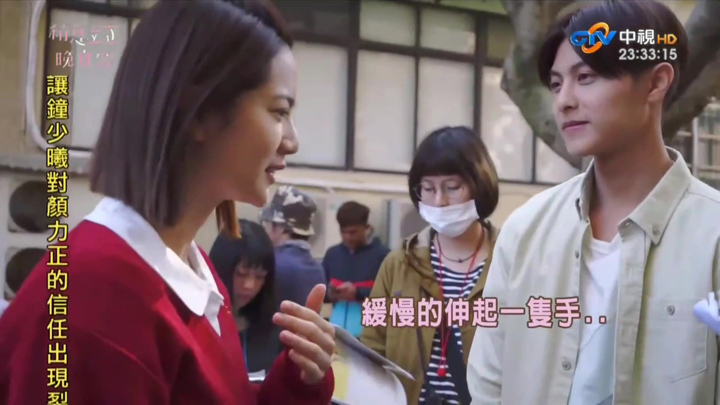 Joanne Tseng and Wang Zi are back to rehearsing the scene, wide smiles on their faces as they go back in character, with the exception of Wang Zi who completes his line speaking to the camera. The day the filming takes place is a pretty nice day. Sun looks to be beaming. So how do they make it look like it’s not a sunny day and it’s raining? 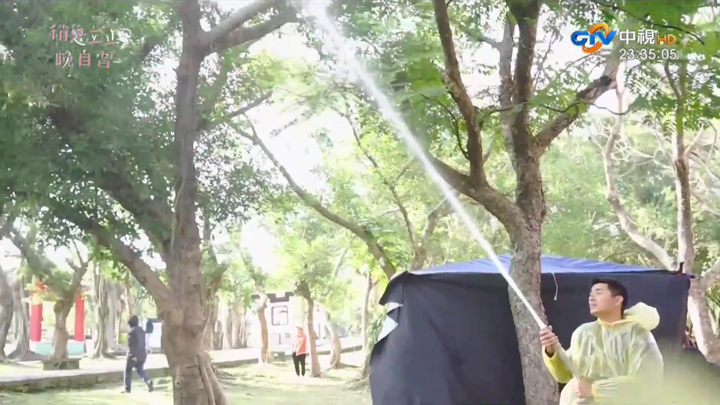 Have a crewmember spray water over the top with a high-pressure hose whilst Wang Zi as Yan Li Zheng and Joanne Tseng as Zhong Shao Xi run to take shelter in the phone booth. 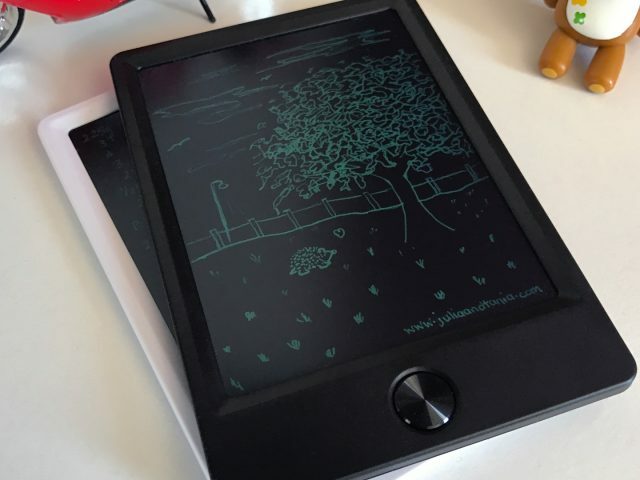 Interview: A romantic phone booth? Interview still taking place in the phone booth, Wang Zi and Joanne Tseng talk about how thankful they are the weather is good before they explain the point of the phone booth scene where Zhong Shao Xi corrects Wang Zi’s pronunciation. The interview moves off to talking about the lack of door on the phone booth before Wang Zi and Joanne Tseng takes the interview off to a suggestive direction after being questioned about the phone booth being possibly a ‘romantic phone booth’. These two are too entertaining. We were just thinking, firstly, how well the scene went. Secondly, we’re so thankful for the great weather. That’s right, because we only have to go to the side then there’ll be a sunny spot for us to dry out. That’s right. Not only is the weather good, the light is good. Isn’t that right? When this scene goes to air and you all watch this, don’t care too much about whether Yan Li Zheng pronounces it clearly. The main point of this scene is young sweethearts taking the boring and treating it as amusing. Where we’re having fun kind of thing. That’s right. When you’re with someone you like, anything that happens between them will be found to be very interesting. Interview moves to focus on the phone booth lacking a door. Phone booth. But isn’t this missing a door? With a door, the booth would feel a bit more confined. If there was a door, we’re done for. If there was a door then… it’s not good to say. Wang Zi’s suggesting acts of the indecent kind. ; o) ; o). Joanne Tseng joins in on this heading. There will be trouble if there was a door. 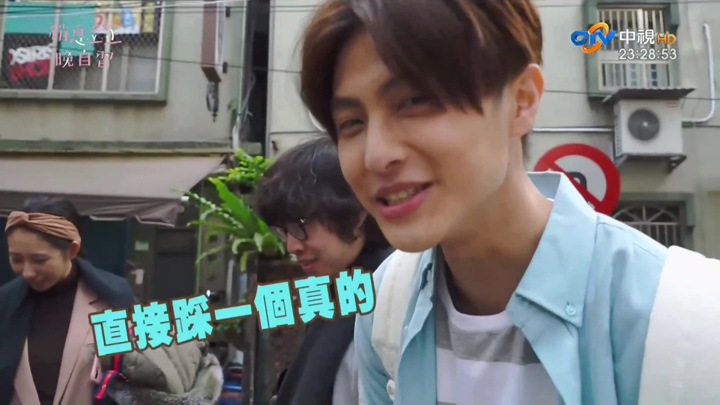 Wang Zi grins, his gaze going from being at the camera to Joanne Tseng who’s grinning the same way he is. She’s thinking the same suggestive thoughts he’s thinking. If there’s no door, there’s no door. If there was a door, there will be… steam. A kind of… a kind of… Smokey feeling. A beautiful haze. Also, add to that a kind of breathy pant. Right, right, right. The breathing sound will become quite distinct. The exhale will have smoke. It will be here we finish the piece (of writing). 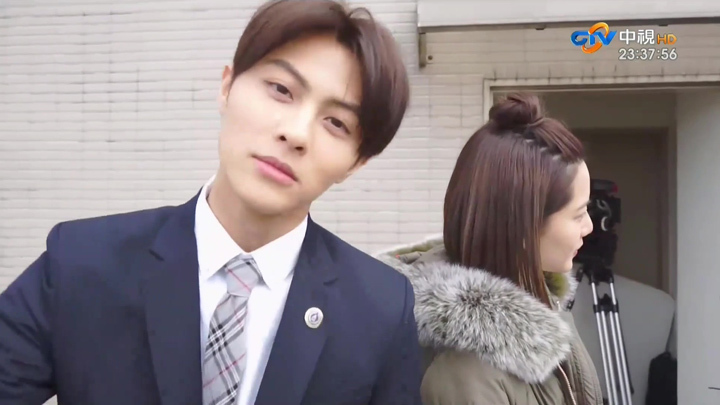 Wang Zi and Joanne Tseng rehearse the scene where Zhong Shao Xi is backed against the wall on the rooftop of the school and she is asked by Yan Li Zheng to be his girlfriend. Right after this, we see Wang Zi move in to hover over Joanne Tseng’s lips to show that at this point he is to kiss her character, Zhong Shao Xi. Good, good, good. Later we will take advantage of this side. We will be filming this side. Wang Zi guides Joanne Tseng closer to the right-hand side of the wall, which the director advises they don’t need to move right up to the side the director is indicating. Director indicates with his hand a small distance from the wall. …there will be a wall. That’s why you need to pretend. 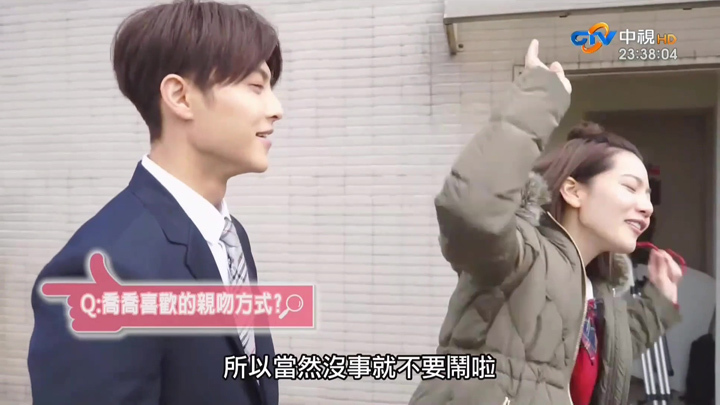 Wang Zi guides Joanne Tseng to where he needs to be before he pretends to smack his hand on the pretend wall which the Director was just talking about. As he smacks his hand on the imaginary wall, a ‘ding’ sound is played as a sound effect. How about you avoid me… never mind. Never mind. I will shake it off. How’s that? Where are you taking me? Have you gone mad? Cut to Zhong Shao Xi being backed up against the wall. Zhong Shao Xi. I’ve fallen for you. Be my girlfriend. Yan Li Zheng kisses Zhong Shao Xi. 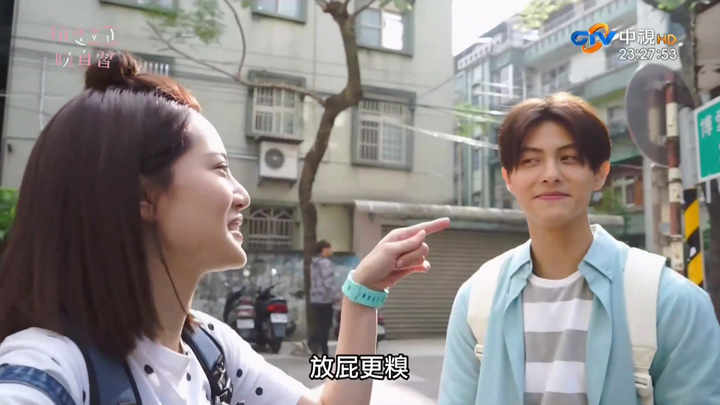 Given the okay, Wang Zi backs up from Joanne Tseng wearing wide grins following the filming of the kiss scene. Wang Zi is interviewed about whether the kiss was a real kiss. Was it a real kiss? Wang Zi goes into his playful, joking mode. 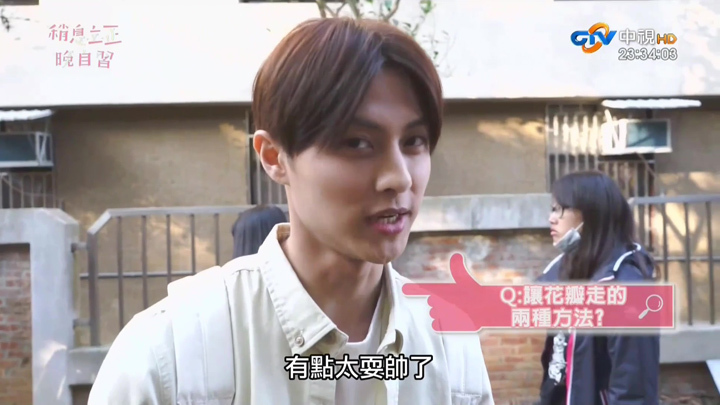 He walks towards Joanne Tseng, bringing her in to join in on the interview. During the first filming, we already kissed once. In this drama, I will kiss out of nowhere, piggyback out of nowhere, hug out of nowhere. Kiss out of nowhere? Piggyback out of nowhere? Hug of nowhere? Cry out of nowhere. I’m just talking nonsense. This gets them laughing including the crewmember giving them what looks like breath mints. 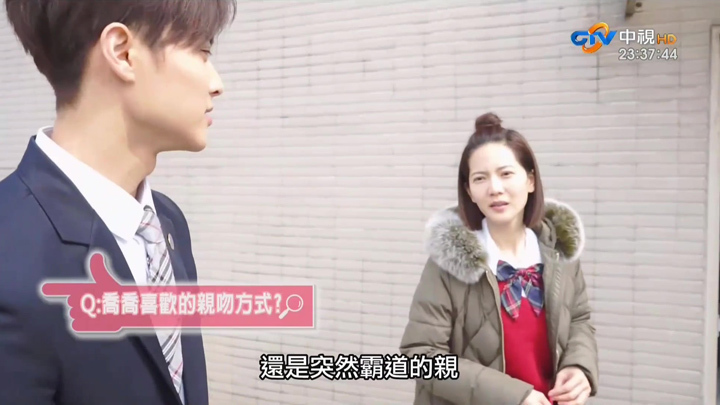 Looks like Joanne Tseng is jokingly suggesting she will make Wang Zi will cry if he dares. Haha. Piggybacking. That’s too frank. This can’t be aired. Interview moves onto preferred kissing methods with Wang Zi asking (relaying?) the question to Joanne Tseng. 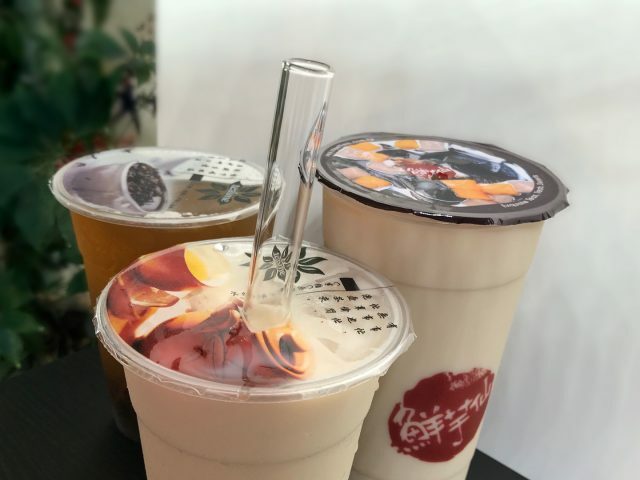 QUESTION: Chiao Chiao’s (a.k.a. Joanne Tseng) favourite kissing method? So do you like tender kisses or sudden forceful kisses? An occasional sudden forceful kiss is okay. Don’t do it too often. Usually, tender kisses is preferable. Shot is frozen to create anticipation and a countdown to Wang Zi rushing towards the camera and plant an air kiss. Yup, Wang Zi was showing us how such a kiss is too quick. This is in line with what Joanne Tseng will be talking about: it’s not comfortable and the reason why she said tender kisses are better and that sudden kisses shouldn’t be used too often. Because forceful kisses is only a mood/atmosphere. That’s all. But it’s really not comfortable. So, of course, if there is nothing happening… Stop playing around. End BTS. These two are so cute. Wang Zi is always playing around with Joanne Tseng. We wonder if this is just for the camera or if it really is how they both are. There were a couple times they were finishing each other’s sentences. How nice to know if these two are this great together. Wang Zi comes off as quite fun and responsive. We like that. Pretty entertaining behind the scenes, right? 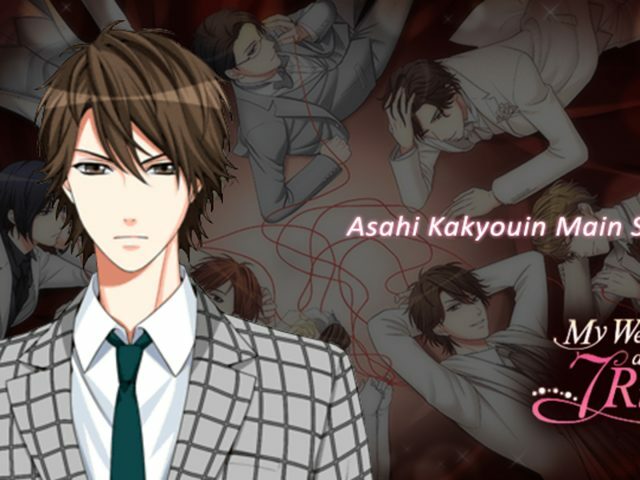 We hope you enjoyed our translation and recap of Attention Love Episode 2 Behind the Scenes! Read our Attention, Love! Episode 1 – 2 recap!